Who can resist the charm of chickens scratching in their run, or the promise of warm fresh eggs each morning? Aside from deciding what chickens you want to rear, one of the first things you will need to take care of is where to house them! You can save a lot of money by knowing how to build a chicken coop when you’re certain of the elements you want it to contain, instead of just putting something together from a kit. The easiest part of building a chicken coop is determining how you want it to look. Sketch a design draft and don’t forget to colour it in so that you’ll be able to see how it fits in with its surroundings. This is not a grave concern if you live in a farming community. If not, you might draw the ire of your neighbors if the finished chicken coop is less than aesthetically appealing. Now that you have the design out of the way, you have to move on to the nitty-gritty aspects of how to build a chicken coop. any chicken coop you construct must provide a safe haven for your chickens. This includes protection from predators as well as extreme heat or cold. Try to situate the coop in an elevated area with good drainage so that the birds stay relatively happy in rainy weather. Having it face the sun also allows quicker drying in during the rainy season. Sliding windows and doors should be present to provide good ventilation to prevent suffocation and illness from stagnant air and noxious fumes that can build up in hot weather. Consider having the walls insulated for protection against extremely cold weather as well. The wood used in the construction must be sturdy enough to withstand weather and being chewed through by would-be predators. The chicken run should be protected with chicken wire that is buried up to 12 inches deep to deter predators from digging their way in. as with the lumber used to build the coop, chicken wire should be made from thick, heavy-gauge wire mesh. 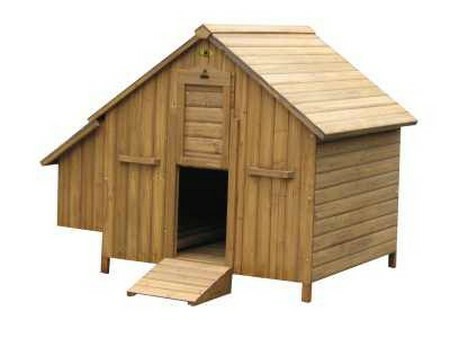 Ensuring the safety and health of your chickens is one thing; a chicken coop has to be regularly cleaned as well. 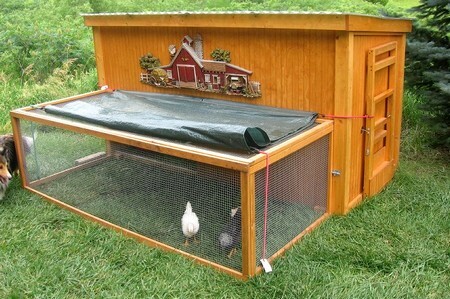 Building a coop that is easy to maintain will cut down on a lot of stress. In fact, it’s an integral part of how to build a chicken coop. having a floor that slopes downward and toward the door makes it much easier for water to drain out when you wash the coop. An array of easily-moved doors and windows also make it easier for sunshine and heat to penetrate the interior, speeding up the drying process. There are suggestions that windows should face south in order to receive direct sunlight and heat even during the winter months.